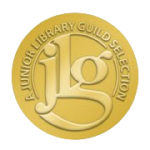 The Junior Literary Guild is a commercial book club. It began in 1929 as an enterprise of the Literary Guild. By the 1950s, the majority of their book sales were to public libraries. In 2004 they started listing their Junior Literary Guild selections at their own website. What we refer to as “winners” are their selections for different age groups. Early American railroading as seen through the eyes of the Dewitt Clinton, the first steam engine built for the New York Central Railroad. Mario, the young hero of the book, helpless after the death of his mother and driven by an inner force as the animals are, grows up in the depths of the forest where he becomes one of the wild things. Ewen Cameron is out with the ’45 and encounters a British officer Keith Windham who becomes his best friend. Kees lives in Holland and has a pet duck named Kleintje. Bud Martin decides to take his bulldog and try New Hampshire. He finds a warm welcome with Uncle John and Aunt Sarah. Three children have adventures in an English seaside town. Inspired by a human circus that performs in their meadow, the fairies put on a circus of their own for the woodland creatures. When the Jacobites call on Ewan Cameron’s honor, he must enter into the conspiracy again in this second installment of the Jacobite Trilogy that began with The Flight of the Heron. In this story of old Rumania, Frosina goes to school to learn weaving, but learns much more when she is called home again. Celia Jane spends a year with her Auntie, then when she is grown up and has a son of her own Auntie comes to live with her. A series of short vignettes describing how goods were carried in historical times. In this, the first volume of her family saga, Laura Ingalls is living with her Ma and Pa, sisters Mary and Carrie in the Big Woods of Wisconsin, near Lake Pepin. On a visit to the baker, the triplets fall in the batter and are made into gingerbread men. It is mother’s birthday but the triplets are short of funds, so they go to work to earn the money for mother’s birthday present. The Swallows return to the lake for the summer holidays but on their third day disaster strikes and they are marooned on shore. Jo Ann has her work cut out for her to bring Tommy Bassick to heel. The Swallows, Amazons and Captain Flint sail in search of treasure and must fight not only a hurricane but also pirates.